You can't help loving a good bit of dystopia, can you? 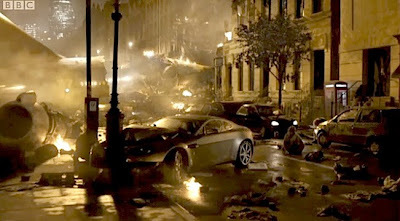 You wait for years for a bit of sci-fi 'end of the world' misery to show up on the telly and then the floodgates open. First, the BBC revived Survivors with reasonable success and tapped into the whole bird/swine flu (select the mammal of your choice) paranoia and now they've dusted off one of the great British Cold War science fiction novels, John Wyndham's The Day Of The Triffids and thrown what looks like a huge ton of cash at it. The last time the BBC adapted the book was back in the heady days of the 1980s science fiction and fantasy boom. Six lean and mean episodes produced by the legendary David Maloney went out in September 1981 to much acclaim and it was regarded as a very faithful adaptation. There have also been numerous radio productions and the rather infamous film version starring Howard Keel in 1962. 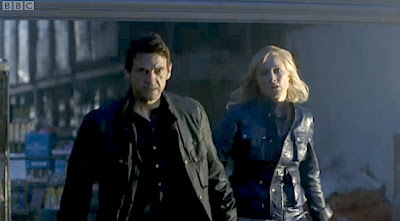 For this new adaptation, Patrick Harbinson has, at least, maintained much of the source material whilst also tweaking certain events and characters to make it a story with a contemporary feel. For instance, here the central character Bill Masen works on a Triffid farm where rather than cultivating the carnivorous plants for vegetable oil they're genetically modified and farmed for a fuel replacement that's solved the global warming crisis. The meteor shower that blinds most of the population in the book and previous versions becomes a plasma storm directed at the Earth from the Sun. So it's ticking all the right boxes for a modern apocalypse: global warming, genetically modified Frankenstein plants, the fuel crisis and the disintegration of society and the family (Harbinson's script departs from the original substantially by having Bill's mother killed by a Triffid and his estranged father pop up at the end of the drama as an expert he turns to for help). In the book, Bill's parents die in a plane crash on holiday). I have no problem with dragging the book into the modern disaster vernacular and Harbinson's done a decent job at retaining the original characters and the general thrust of the story. An initial problem is with the flashbacks to the death of Bill's mother and a rather hamfisted attempt to signal throughout the 180 minutes of this drama that the ultimate solution to the Triffid problem has something to do with a native mask and a tribesman waving what looks like a dripping bit of asparagus at the camera. Obviously, it is Harbinson's way for Bill to connect with a childhood trauma in order to repair relations with his father and find that some good might eventually come from the premature death of his mother and a childhood spent in Brazil mucking about with man eating plants. This would be all very well and good but alas Dougray Scott has all the charm of a deep freeze as Bill Masen and that's a big problem because he's...er...the hero. He's somewhat stoic and to the degree of actually not making us care as much about the character as much as we should, even though Bill is supposed to be rather reserved because of his past, and it takes until the middle of the second part of the adaptation, when Bill encounters the two girls Susan and Imogen, for him to show even a glimmer of emotional complexity and for us to actually warm to the character. The other major player is Joely Richardson as journalist Jo Playton and she at least has some dimension and empathy to her character and reacts pretty much as any normal person would in such given situations. She's a strong female character but, however, there are moments in the first part where she does come across as entirely stupid and gullible for an allegedly intelligent journalist. 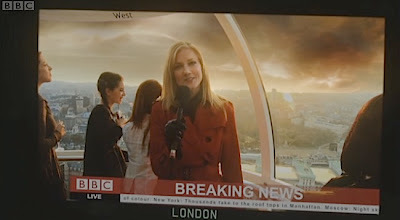 Harbinson uses that tried and tested cliche for describing a global phenomenon: 24 hour rolling news coverage with Jo in London handing over to a reporter in Sydney and various other screens in the newsroom showing famous world landmarks just to reassure us that this is not just a cosy British apocalypse. However, the production really does have to be congratulated on its sense of scale. 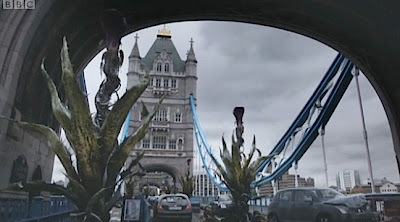 Once Bill Masen recovers from the Triffid attack and leaves the hospital we see a devastated London from his point of view. There's a spectacular moment where an aircraft falls from the sky and debris hurtles through the window of Bill's hospital room. 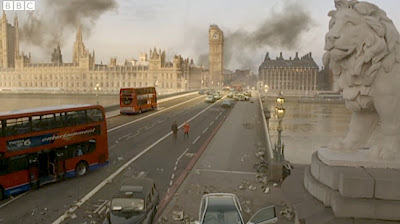 Director Nick Copus conveys this vision of the apocalypse via some very brilliantly staged location shooting mixed with convincing computer generated effects. However, the aircrash introduces us to perhaps the weakest performance in the film. 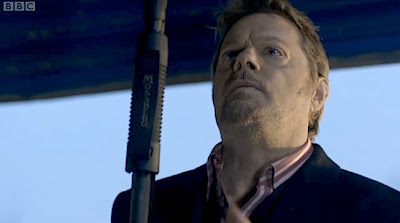 Eddie Izzard plays baddie Torrence who miraculously survives the plane crash with just a few bruises and bits of torn clothing by locking himself in the loo and inflating dozens of life jackets. Would that actually work, I wonder. Nevertheless, Torrence survives and alas I do feel Izzard is mis-cast. I think he's a wonderful stand up and a great humanitarian but his acting leaves a lot to be desired. He isn't convincing and whether it was his intention or not he makes Torrence a rather fey, slightly ludicrous character and that 'Yes...ha, ha, ha!' as he stumbles from the wreckage can't help but make you feel that at any moment he's going to launch into a story about cats drilling for oil despite his attempts to be serious in the role. His presence makes this a serviceable adaptation rather than a great one. 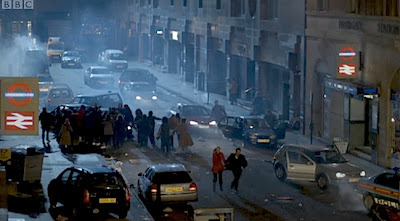 Copus and Harbinson generally keep to Wyndham's plot throughout the first part, with Masen abandoning the hospital crowded with panicking blind people and Jo emerging from a wrecked Moorgate tube station into streets full of chaos and being mobbed by those demanding help. These are again stunningly realised scenes shot on location with tons of extras and prop vehicles, atmospherically lit and sympathetically directed. Meanwhile, Ewen Bremner as a crazed environmental protestor has infiltrated the Triffid farm in the chaos and let all the Triffids free thus setting up further conflict for our heroes. There's a very odd bit which doesn't quite work where Harbinson and Copus try and be a bit clever, as a police cordon collapses into chaos, with quick inter-cuts to some bloke playing a violin who eventually jumps out of a window. I was getting a bit fed up with heart wrenching strings on the soundtrack too, mate. And yet the very brief shot of a small child leading her blind father along the streets is simple and effective. After a somewhat ponderous half hour we finally cut to the chase and get to the crucial moment where the Triffids are first revealed. The production rests on how effectively they've been realised and when Masen takes Jo to her father's house we get our first hint of them but wisely Copus keeps them shrouded in mist and uses distinctive sound effects to portray their menace. 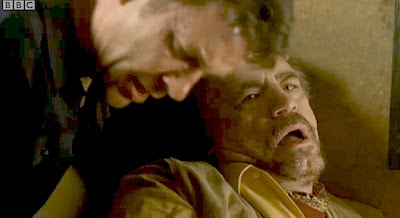 We have to wait some time before we get a real sense of what they're like and the middle section of the first episode tends to plod until Masen and Jo meet Coker, played by Jason Priestley, as he tries to convince a Home Office operation inside the Gherkin to let him and the group of blind people he's with into the building. Coker falls in with Torrence and the rest of the story involves Bill's attempt to get to his father and find a way to stop the Triffids from overrunning the human population. However, Coker and Torrence have other plans for him. There are two stand out sequences that bring the first episode to a conclusion. Press ganged into helping Coker scavenge for food, Bill and Jo are attacked by Triffids in a supermarket warehouse and later Torrence and his men abandon Bill and Coker on Hampstead Heath to the mercy of the Triffids. Both sequences are highly effective, full of tension and atmosphere with the latter finally giving us a good look at the Triffids themselves. The effects are very decently done and certainly don't let the production down, capturing much of Wyndham's original description and adding in some visceral horror too. 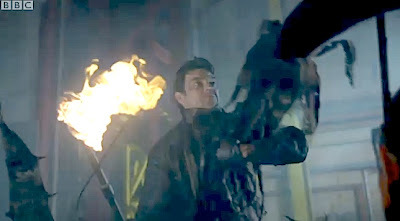 Trouble is...any suspense generated by the doomladen fate of Bill and Coker is utterly destroyed by the 'Next Time' trailer in which Bill and Coker are shown alive and well. Well, that's all right then. Part Two inevitably sees the pair of them escape from the Triffids on the Heath, with the proper villain of the piece, Osman, getting his comeuppance at the tendrils of those feral dandelions. 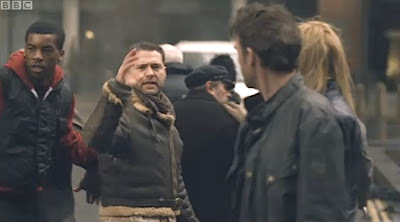 Pity Shane Taylor wasn't given the role of Torrence because at least he'd have made a more powerful presence instead of Izzard's camp purring and posturing. Anyway, Torrence has seemingly convinced radio journalist Jo that Bill is dead. He wouldn't have convinced me, I'm afraid, and for an intelligent woman she's terribly gullible. But that's also down to a sense that Izzard is giving a 'performance' rather than actually getting to grips with a character. 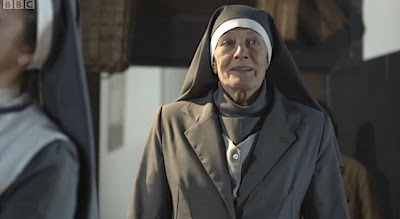 Meanwhile, Bill and Coker fetch up at an isolated convent and the pace more or less starts to stand still for a bit of religious navel gazing aided by a rather rich cameo from Vanessa Redgrave as the mother superior Durrant. Rather horribly, she thinks by sacrificing people to the Triffids she can make the community at the convent viable and sustainable. Well, God said so, didn't he, according to the rather odd mother superior. Jo's escape from London is handled really well by Copus and it's genuinely thrilling when she's trapped in the back of the container lorry and the Triffids have surrounded her as she attempts to steal a car. It again demonstrates that Copus has a better handle on the action sequences than he has on the quieter, character driven moments. Harbinson's script stretches the twin situations with Bill and Jo to fill out most of the middle of Part Two, drops the whole section of the book where Bill and Jo are reunited in Shirning Farm and meet Dennis and Mary Brent and where the book covers six years, Jo having children and the development of the farm until their eventual decision to go to the Isle Of Wight. Instead he brings in the two girls, Susan and Imogen and then reunites Bill with his father, who is not in the book at all, to try and sort out the Triffids. These changes aren't particularly bad and the final half of the second episode works better than the first half with Brian Cox providing some decent support as Dennis Masen. 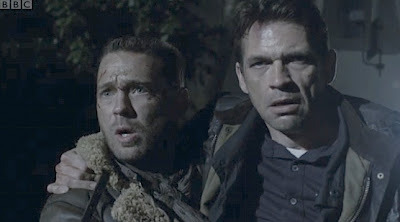 Certainly, Dougray Scott drops his granite like stoicism here and warms up a bit, making Masen a little bit more appealing. 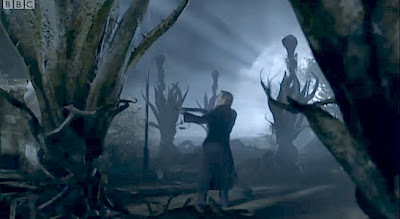 There's again a very atmospheric, chilling sequence where Bill and surrogate daughter Susan go hunting for a Triffid in order to genetically modify it and prevent the mass sporing. It was a painfully obvious set up though that tomboyish Susan had 'victim' tattoed on her forehead when she suddenly shows up at the abandoned Triffid farm. Sure enough she nearly gets eaten by one of them. A good sequence though and I loved Bill throwing himself onto the plant and wrestling with it. However, after a very harrowing sequence where Dennis is attacked and killed by a Triffid and the plans to genetically modify the plants before they spore goes awry, Harbinson drags Torrence and his men back into the story. In the book, Bill and his family simply escape under cover of night to the Isle Of Wight. Because Izzard's performance resembles that of a Bond villain (and not a very bright one) the climax tends to lose its power. Visually it's very impressive with all the Triffids storming the farmhouse and it's brilliantly shot but then in comes Chekov's gun, or should that be Chekov's mask! Copus had hammered home visually the obvious importance of the tribal mask and here Harbinson postulates that the only way to get past the Triffids is to pop the mask on and then blind yourself with Triffid venom. Sorry, I don't really buy that. Attempting to make their escape a bit more exciting and dragging in Masen's childhood trauma to beef it up doesn't do the adaptation any favours. Besides, wouldn't you actually remember why a tribesman dropped venom in your eyes? And wouldn't you have that knowledge passed on to you? Yes, it's all about harmony with nature rather than ripping its guts open and taking what you want but that message is feebly demonstrated in a quick wrap up at the end. On the whole then not a bad adaptation. It does take some liberties with the original book but also attempts to stay reasonably faithful to it which is more than can be said for the 1962 film. Copus' direction is stylish and accomplished and is at its best in the scenes featuring Triffid attacks, generating decent levels of tension and excitement. What doesn't work is his attempt to provide interesting, empathetic characters. Compare Scott's bullish version of Bill with John Duttine's far more sympathetic version in the 1981 BBC adaptation and you'll see what a difference certain choices made in acting a role can make. Izzard is horribly miscast and Torrence is given way too much screen time over the far more interesting and vicious hate figure Osman. Torrence is also given some sort of Churchill fixation which seems a bit odd for such an opportunist sociopath. Joely Richardson is good but again there is a distinct lack of chemistry between her and Scott to make the burgeoning romance between Bill and Jo actually realistic. Redgrave and Cox must be happy they've made another mortgage payment on their respective properties. And the Triffids? Not bad, and best served by keeping them shrouded in mist and darkness which Copus does for most of the running time. Better than their 1981 counterparts which tended to resemble rather wobbly stalks of rhubarb. A good effort overall, achieving the necessary epic scale visually (Ben Smithard's work as Director Of Photography is especially good) but slightly outstaying its welcome at 180 minutes and needing much more pace at times, plus if Scott and Richardson had nailed the vital chemistry between Bill and Jo this would have been quite impressive. Great Review. I felt the piece's main drawbacks were the endings of both parts: if you show the characters in mortal peril, don't follow it up with a "Next Time" trailer showing them to be running about safe and well. Similarly, walking out and rowing down to the Isle of Wight, explaining that "water was the barrier" between humans and triffids seems a pretty poor finale. I wouldn't have been happy with with an out-and-out destruction of the triffids, but surely plants would relish getting a drink? Perhaps that is the ending of the book (which I have yet to read), but a more ambiguous ending would have nailed the terror of the idea, I think. Anyway, nice blog: I'll certainly be following! Didn't like it at all, full of inconsistencies, plot holes and cliches. They have just tried to make a US style action movie out of it, and ripped out the heart and soul of the original story.